s more important to have and follow a sound, easy to understand, Money Risk Management plan. 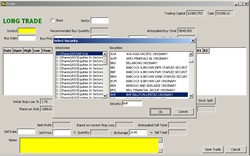 This user-friendly software will automatically calculate your trade size or how many shares to trade, where your initial Stop loss exit price level will be, protecting your Trading Capital & your Trailing / Profit Stop exit price, to protect your Profits. 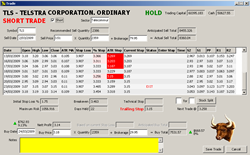 This Money Management software will give you a simple step-by-step method of keeping your emotions in check, remove the guess work from your trading, help monitor your performance accurately, with simple to understand reporting and track each trade easily as it integrates with your MetaStock data. It will help make sure you benefit by using sophisticated Money Risk Management strategies that work! How to Handle your trade? 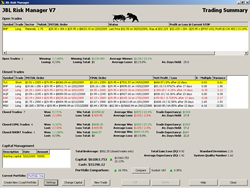 "After entering a trade, you are no longer a Trader but a Risk Manager." If you are a beginner and do not know why money, risk and trade management are vital components of your trading we recommend you read Trade Your Way to Financial Freedom and Trading For A Living. Without adopting these disciplines, you are highly likely to become an emotional trader and take unnecessary risks with your capital. 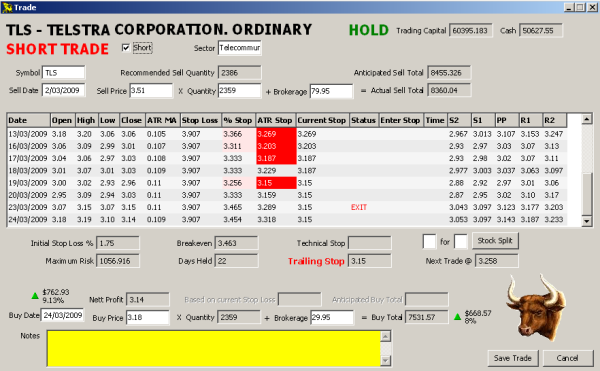 This software will help put you on the path to disciplined trading. 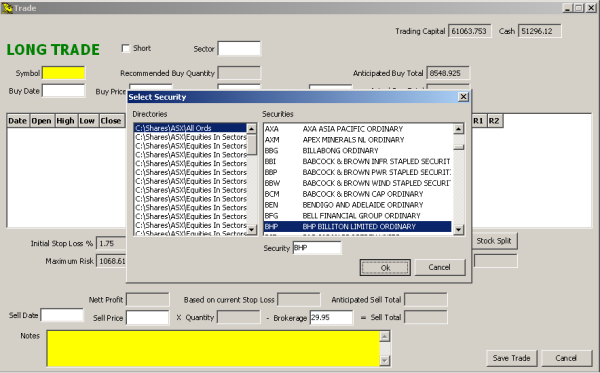 If you are already an active trader, you are most likely interested in a simple way to manage your trading. 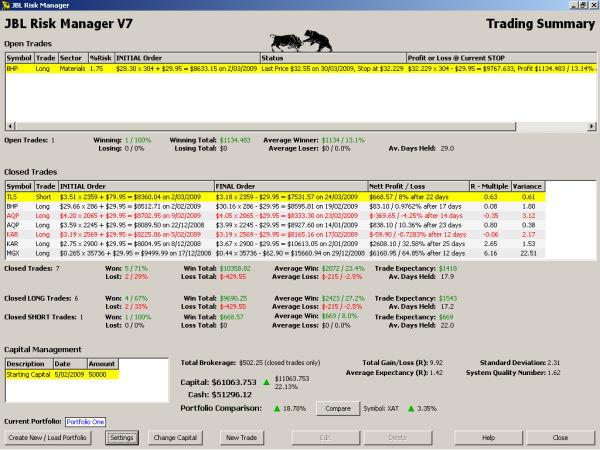 JBL Risk Manager gives you Automatic Trade/Position Sizing, Initial Stop and Trailing Stop exit price calculations, Multiple Portfolios, Short & Long trades, integrates with your MetaStock database, Stock Split Adjustment, Performance: Win/Loss ratios, Trade Expectancy and with permission from The Van Tharp Institute System Quality Number, R-Multiples and R-Expectancy. Our Profit or Trailing Stop will never be below your Initial Stop Loss. Always steady or moving up when in Profit but never down and will adjust automatically. Your maximum Risk per trade (loss) will never be more than *2% of true Trading Capital (less brokerage). 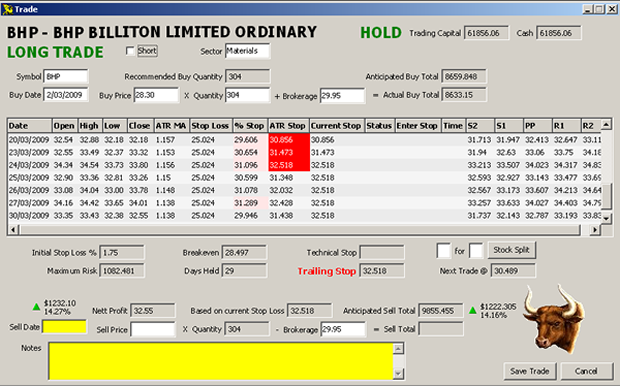 Automatically calculated and displayed before every trade entry. JBLRM will automatically trigger an EXIT! when your Stop, is hit. *Of course, you can also modify these parameters, easily. 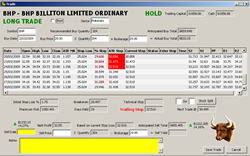 JBLRM can also act as your Performance monitor; it will track and progressively calculate your trading performance automatically. Also ideal for those paper trading or back testing your trading parameters. 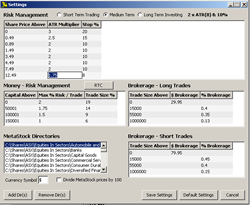 JBL Risk Manager was developed for those Traders and Investors that trade Shares but Options, Forex and Futures is also currently being considered.